It's a well known fact that I frequent the farmer's market as part of my weekend errand hopping. We love seeing our local farmers and interacting with them. We not only get to know where our food is coming from but we also support people locally. While the husband primarily totes our groceries around, when the bags get full I do my part. I carry my one bag. 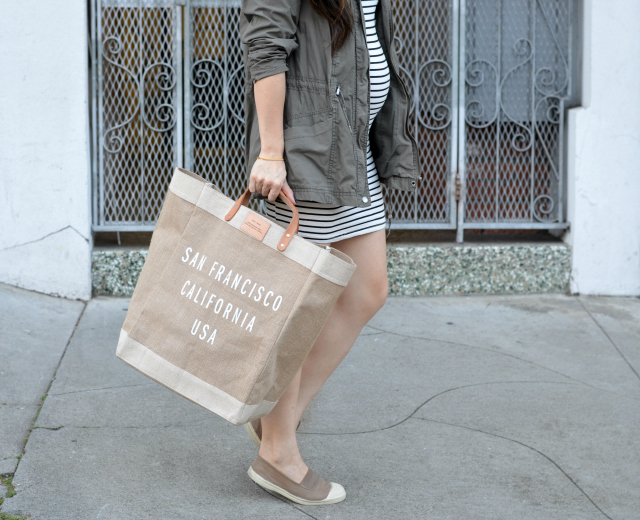 I've owned the Apolis market tote x SF for a while now but never showcased it on the blog. The Apolis totes go towards a great cause by supporting employment for 21 women. It's really great for the farmer's market since it features a waterproof lining and has leather straps that are reinforced by antique nickel rivets. It also has a small inside pocket so I can stash change from my purchases. And, I admit, I adore the way it looks too. I love to support companies that contribute towards a bigger purpose. It's a wonderful endeavor that I'm glad to promote simply by carrying a market tote. Do you support any companies this way? Good for you! I cannot wait until our Farmer's Market opens back up in April. I love this outfit. In fact, I am wearing the almost exact same thing in real life today. LOL Look at that cute little belly! 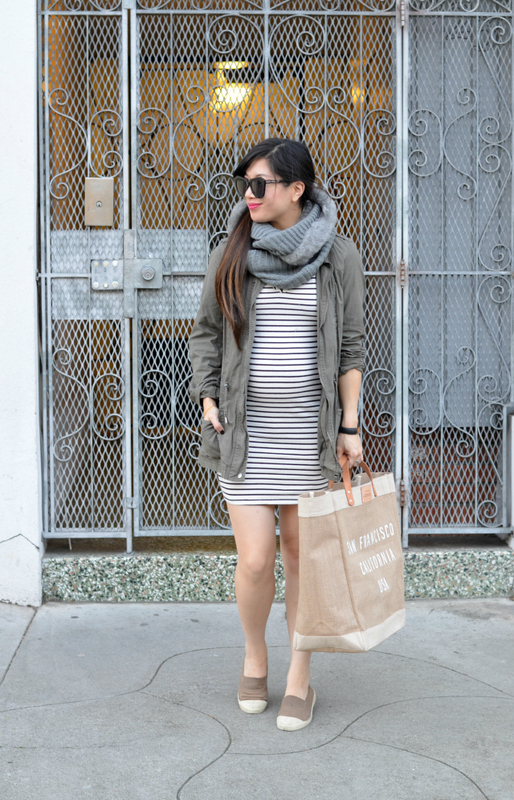 You wear your bump so fashionably! Love those fun sneakers too. That's a fantastic tote to bring to the farmer's market and even better that it supports such a worthy initiative as well. You are so adorable! Love this dress and scarf together! This outfit is awesome! 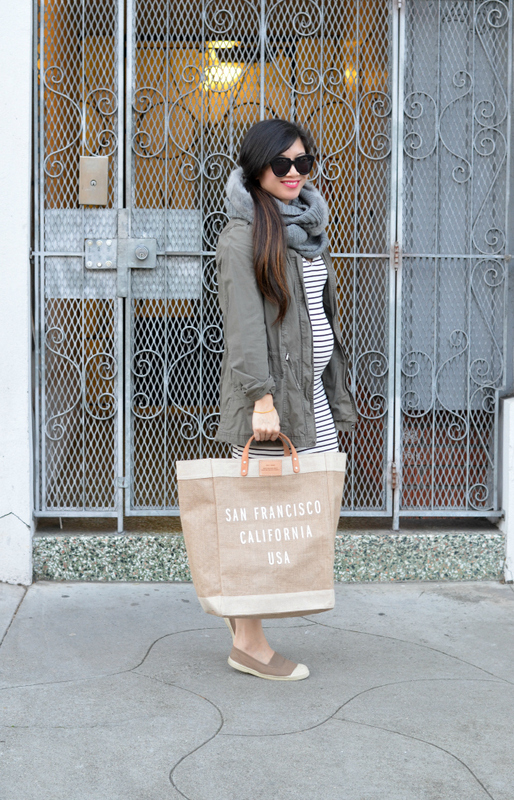 Love the layers and the tote. It's great when you find companies that you love that support great causes! Love your striped dress and casual jacket, dressed up by that dazzling smile! I do try to buy local, I try not to buy from big chains, and have not accepted any paid posts from would be sponsors. I do not mind that others, too, but my preference is not to. That's the perfect Farmers Market tote! In the summer we go to Farmers Market on the weekends too :) I wish they had them during the winter too. You look so stinkin' stylish in this outfit! Love it! I absolutely love this! The bag is absolutely perfect for a Farmer's Market trip! LOVE this look! You look adorable in that dress and camo jacket! Eeek, you look so adorable. I'm kind of bummed on the leather straps! I'm vegetarian so it's not suitable for me. I love the idea of supporting local, sustainable businesses. We need more!. I love brands and companies with a conscience. Over here we have "Thank You" water (and now other products) were all the profits go towards helping other nations have access to clean water. I always try to buy a bottle or two of this rather than others because of it's purpose. So cute! 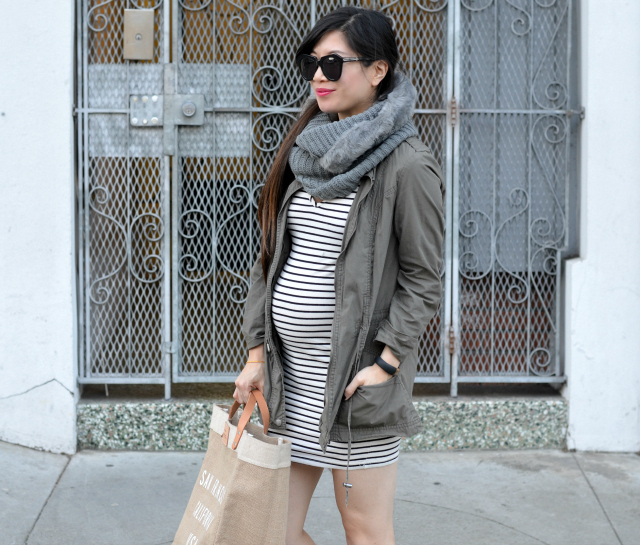 I love the military jacket with the stripes! Cute dress!! That tote is great and I think it's wonderful that it helps supports a great cause! That bag is so cute and I love that it supports such a great cause! You look so cute. 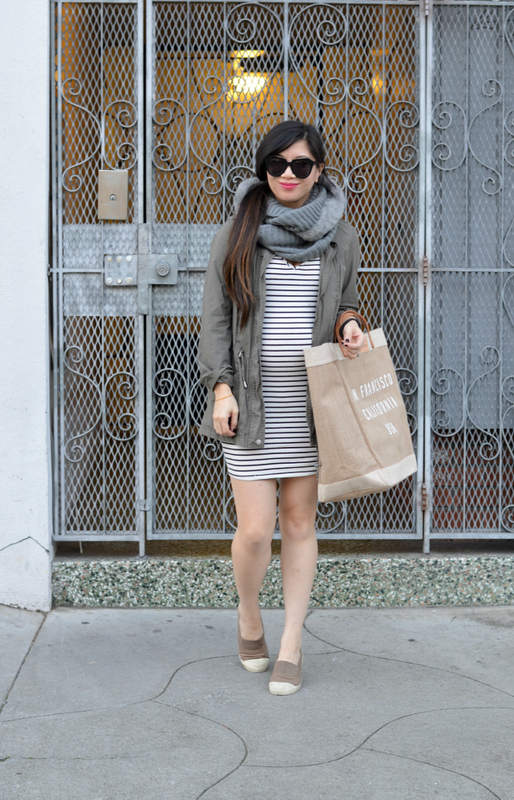 I love the utility jacket and stripe combo! I don't shop at the FM as much as I used to because I get a weekly CSA delivery. My son loves it because he thinks the farmers specially box the items for him and we get to try things that we may not buy. Great tote - it's perfect for the FM. I love to hear that you're out there supporting local business!! We don't have farmer's markets at this time of year, but I'm so excited for them to open up in the spring. I feel like everything tastes better when it comes from a market. such a nice look, love the striped dress and the jacket! That is great! Not only are you doing good by supporting your local farmers and saving the planet with your reusable bag but you have helped people find employment in the process!! Good for you :) You look adorable!! Well you look too cute Nancy! Love your coat and dress. I do shop local. Especially produce. We have several farmer's markets. I featured one on the blog one time. That bag is nice! I like the size, because it will hold all of your purchases. love the shoes and sunnies! xO! Such a super cute look! Love that jacket a lot!